Living 3,500 miles from family and friends has its challenges—like keeping in touch despite varying time zones. While a text app or voice calling service is usually enough to stay connected, my niece and nephew are still too young to operate a digital keyboard or carry on a phone conversation. They’re also too young to sit still for more than two minutes, turning a video chat into a game of computerized cat and mouse. But a Silicon Valley robotics startup has a solution: Ohmni. 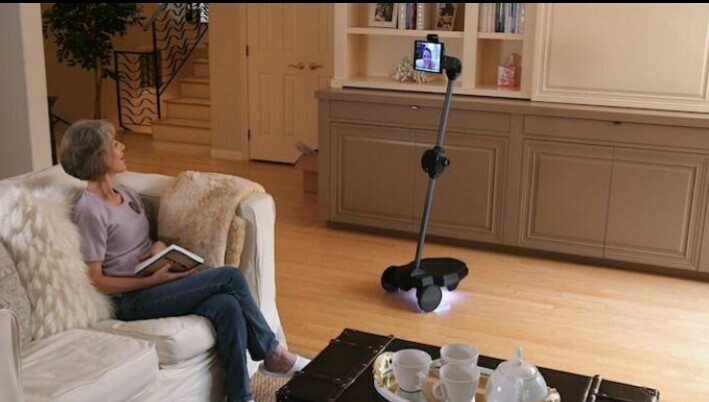 The home robot—”a fresh approach to telepresence,” according to manufacturer OhmniLabs—makes it easy for folks to share experiences—cooking, watching movies, playing games—across any distance. I can easily imagine my brother and sister-in-law unfolding and powering up Ohmni, letting me virtually follow the kids from room to room as they show off their latest stuffed animals, dance moves, and toys. Call with one click from any Mac, PC, or Android device using the Chrome browser; remotely control Ohmni with your keyboard, trackpad, or touchscreen. Standing at “human height,” the robot employs proprietary MotionMap technology that allows for floor-to-ceiling movement, from subtle screen tilts mimicking the nod of a head to a full-body scan of a new outfit. Whisper-silent brushless motors, meanwhile, promise a smooth, quiet ride, “so you can hang out for a long time without bugging anyone,” lead engineer Mark Edstrom said. Because that’s just what every family wants: a digital face lurking in the shadows while they sleep. If that’s your thing, the Ohmni Robot is available now to pre-order in white or black for $1,399—$500 off the expected retail price. Jazz it up with a bamboo base cover and emotive LEDs for an additional $160. In less than two days, the skinny cyborg raised more than 70 percent of the Indiegogo fixed goal; OhmniLabs has a month left to collect at least $100,000.